Samsung is like an old king of the smartphone space which still has all the authority in the flagship segment with arguably the most complete flagships going by the name of Galaxy S9, S9+ and the much touted Note 8 but one thing is quite established now that Samsung has lost all Its dominance It once had in the budget space and It doesn’t appear to be trying to regain It back, instead Samsung is looking to strengthen Its mid range arsenal: pricier than budget devices but not as much as flagships with the features like a lite version of the flagship. This new strategy hasn’t been widely successful yet as people don’t find much value in Samsung smartphone unless Its a flagship. 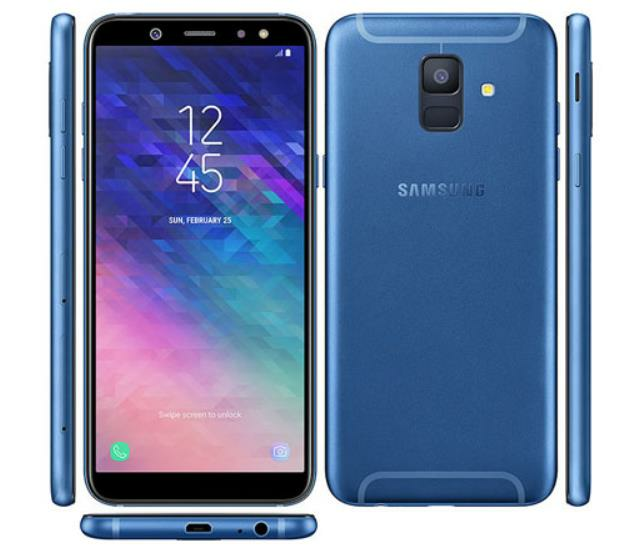 Samsung Galaxy A6 is another attempt to garner customers who can’t afford a flagship but have money to spend which is a lot more than what a budget device would cost. Galaxy A6 came in with A6 Plus, Its elder sibling, which we’ll cover in another post. Let’s know more about Galaxy A6 and find out If Samsung is doing justice with the mid-segment. Samsung has one of the best industrial design and manufacturing processes in the world and you can be assured of that by the looks of this smartphone. Built primarily of metal, the smartphone feels totally premium without any two ways about It. The metal construction makes the smartphone solid and well-gripping in hand. On the front, is the iconic Infinity Display at an aspect ratio of 18.5:9 with a resolution of 720 x 1480 pixels with a pixel density of 294PPI on a 5.6-inch Super AMOLED Panel, the resolution isn’t what we were expecting, It had to be at least a 1080p panel but Samsung has invested into an infinity display which has some borders on the sides and very significant ones at top and bottom, without any curved fascia as in Galaxy S9. The display is manufactured by Samsung is super bright, super saturated and the colors just feel so crisp and punchy. The display is Super AMOLED so the pixels are closer and overall, the display feels a lot better than a 720 x 1480 display. At the back, we find a refreshing approach to Antenna bands by flaunting them, It's quite similar to thick white lines in case of iPhones but instead of going edge to edge these bands just curl around on the rear at both top and bottom. In the center, is the vertically oriented camera housing with rounded corners. The fingerprint sensor sits right below the camera, followed by Samsung logo embellishing the smartphone. There’s more text on the bottom with all the regulatory information and stuff but It is not profoundly visible. We are not satisfied with the size and placement of fingerprint sensor as It is quite difficult to reach and It still has a quite small surface area. The power button and volume controls can be found on the right side. The smartphone is a bit heavy despite being slick at 7.7 mm thickness. This makes the smartphone quite sleek and gorgeous in hands but also difficult to hold for longer periods. We admire the design of Galaxy A6, It carries the surplus amount of premium and finesse, It is somewhat heavy but doesn’t compromise on build quality and construction materials. The hardware side of things isn’t a whole lot sweet with Exynos 7870 running the business. For those who don’t know, Exynos 7780 is an octa-core CPU with Cortex-A53s all lined up and working at 1.6GHz. MALI-T830 MP1 serves as GPU on Samsung Galaxy A6. The device is grossly under-equipped for Its price and we are disappointed, as the devices coming in at half the price pack equal or better performance. Performance is one of the most crucial aspect of a smartphone and while the normal, everyday tasks are just fine. The deficiency in power starts to show up as you push the device further by opening several apps and switching between games. Galaxy A6 comes in two variants with 3GB RAM and 32GB of onboard memory while the other one having 4GB of RAM and 64GB of onboard memory. 3GB of RAM is enough for most cases and makes multitasking bearable on this smartphone. There is a dedicated MicroSD slot to expand the storage up to 256GB. The general performance is no doubt fluid and snappy but the delay in app launches and the struggle this phone faces on facing multiple apps is quite conspicuous. We recently reviewed Honor 7C which is a budget device and shockingly the performance here is quite similar. Samsung has just thrown the value for money parameter out of the window and for a smartphone priced above ₹ 20k, you don’t expect that. MALI T830 is capable but is still not up to Adreno’s standards on other Qualcomm Snapdragon-based smartphones so the smartphone does fair in casual games but starts to struggle with heavy titles which get really bad when some other apps are open in the background. The smartphone scores 723, 3605 on GeekBench single core and multi-core benchmark tests. As with most Samsung smartphones, the camera performance sways us away. The smartphone has a single, 16 MP (f/1.7) sensor with LED flash and while you might be complaining about dual cameras, hold on because this smartphone camera does a lot better than other smartphones which have dual sensors. Yes, the smartphone is missing the portrait tricks but It takes absolutely stunning shots whether It be bright daylight or some low-light situations, thanks to the wide aperture. In some shots, we observed excessive sharpening which is software based as Samsung has to compensate for putting a wide aperture lens. The color reproduction is great and noise levels are fairly low, even in low-light conditions. There is a whole lot of detail and yeah, Samsung cameras do have the tendency to make the scene appear more cinematic and picturesque than It usually is so you can’t escape that. The front sensor is equally delightful with 16MP, (f/1.9) with soft LED flash for night time selfies. The front sensor also captures some really amazing photos with tons of details and less noise even in low-light situations, It is not as good as the rear sensor in night time but It sure makes a great selfie camera. Again, the selfie camera does some softening on Its own with some added processing to make the photos appear more ‘good looking’ and that’s again a Samsung thing you can’t do anything about. Overall, we are quite pleased with the camera performance of Samsung Galaxy A6, It does equally well on all front and rear shots with good details and dynamic range on spot. Samsung Galaxy A6 runs on Android 8.0 Oreo out of the box, with Samsung’s own software overlay on top. The skin is called Experience 9.0 and Its a grown up version of TouchViz we’d say, but a lot better. We like the overall look and feel of the skin but we are still puzzled with the point of having Samsung’s own apps and Google’s apps which perform the exactly same thing, for example, Samsung Internet and Google Chrome. Samsung Mail and Gmail or Inbox and a whole lot of other stuff which just feels redundant and makes the overall experience clunky. On top, there are some Microsoft apps which can’t be uninstalled. Experience is fast on Its way to become TouchViz and Samsung is not much concerned. There are a lot of features, well packed in the UI and a lot of them are quite useful as well, but we feel the Samsung Experience is getting more and more bloated by each iteration. There is no clear promise of Android P and Samsung has a history of being the laziest OEM to ship latest updates, keep that in mind. Samsung Galaxy A6 gets Its power from a non-removable Li-ion, 3000mAh battery which is well enough for a day. Credits to this can be attributed to the OLED panel and the low-power chip which powers the device. Talking of charging, things get a little out of color here as there is no fast charging support, on top of that there’s a MicroUSB port instead of a USB-C, this all just makes us ask a single question, “Why? Samsung” There is a single downward firing speaker beside the charging port and yes, It is not outrageously loud but It is not any bad either. It has a strange sharp, shrilled output which is a little hard to notice until you compare It with other speakers. The position of the speaker does let the sound get muffled when holding the phone in landscape mode. Not cool. There is a dedicated mic for noise cancellation during calls and It works great, besides that the audio experience on earphones via 3.5mm jack is quite enriched due to the presence of Dolby Atmos Sound. Just plug in some cool headphones and the clarity, staging as well as separation is amazing, making a worthy listening experience. The device doesn’t carry any IP ratings with It, so don’t get it close to water or dust, for its longevity. The panel is an OLED panel, has Samsung’s always-on features where you don’t have to wake the smartphone to see time, notifications and other basic stuff. It makes life easy. Beautiful design and a lot of premium appeal. Dolby Atmos sound on earphones is quite exciting. Poor performance considering the price. Software experience is kind of redundant and getting bloated. Slightly heavier but sleek, so can slip from hands easily. Fingerprint sensor placement is not comfortable. Display resolution is still 720p, should have been at-least 1080p. Galaxy A6 is available in four shades namely Black, Gold, Blue and Lavender, Blue is our personal favorite but others look gorgeous as well. Priced at a whopping ₹ 21,990 on Amazon, this device is for a few who love Samsung beyond the term ‘value for money’. It is too pricey and just for none reasons whatsoever. So that’s pretty much everything about Samsung’s Galaxy A6, If you love Samsung smartphones, want a great camera, don’t care much about performance then this might be a good buy for you else, we are not rooting for this one. Samsung has made quite many sacrifices here, making this smartphone just a nice camera phone with a tall display with performance poorer than devices half Its price. The camera is no doubt supremely impressive and the display is great too, but Galaxy A6 as a complete package is a lot short of what we expect at the price. What do you think?